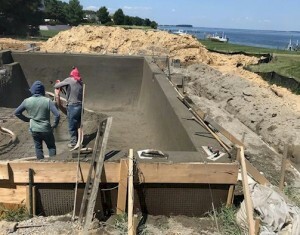 Right now is a great time to get a new in-ground pool installed! Our experts will design the in-ground pool that compliments your home perfectly and brings your family many years of summer fun. Building your pool and surrounding patio at this time of year is a great idea because your outside home will be perfectly ready for you this spring. You can have it looking like its been a part of your home forever with plantings that come alive with your trees and grass as green as your existing lawn. Even better, we won’t be in your way when you are wanting to enjoy your outdoor time. Our pools are custom built to meet your standards and design and they are the absolute highest quality, built to give you many years of outdoor fun and relaxation… Call F.A. Hobson Landscaping at 410-739-6800 and let’s get building!